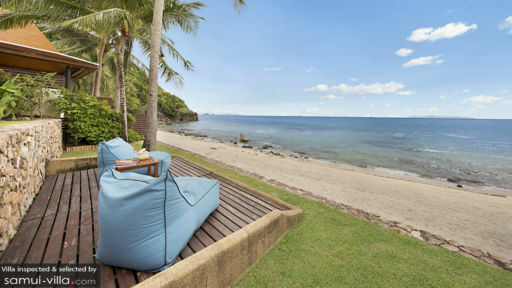 A stunning beachside property in Koh Samui’s Taling Ngam, Baan Samlarn is a five-bedroom resort that directly leads to the beach out front. White sandy shores and glistening ocean is coupled with traditional Thai influences as well as luscious foliage. An infinity pool helps you engage with the ocean view as you can lounge all day enjoying the spectacular view. The beautiful retreat offers many-a hidden lounging spots, lotus ponds, dense trees, and water features. You are sure to make cherished memories while spending with friends and family at this welcoming and luxurious holiday destination! Villa Baan Samlarn has five, well-furnished and vibrant bedrooms, two of them upstairs and three on the ground floor leading to the garden and pool. Of the room upstairs, one is the master suite with a front-facing view of the ocean. It is furnished with a king-sized bed and features warm interiors for a restful stay. A comfortable sofa facing a large TV is found in the room as well that you can enjoy when you tire of the grand view. Downstairs two bedrooms lead directly to the pool with a calming view of the lush vegetation. The bedrooms are either furnished with king-sized beds, or single beds. The bedrooms feature all-glass doors that bring in the outdoors inside with a mesmerizing and naturally-abundant ambiance where all you see in pristine skies, verdant gardens, and blooming flowers. Each bedroom comes with an en-suite bathroom, and one is partially open-air with a freestanding bathtub in the middle of a private garden. Surrounded by a spectacular timber pool deck, and flanked by an equally magnificent water feature is the lavish 15-metre swimming pool at Baan Samlarn. With bougainvillea abundantly blooming around the pool, dazzling green vegetation bordering it, and the clear blue skies overhead, the outdoor are nothing short of a postcard-worthy scene. Plenty of sun chairs are placed on the deck under traditional square parasols to keep you from direct sunlight. An outdoor sala situated right beside the endless ocean, is fully-equipped with comfortable seating, a BBQ, a dining area for the perfect alfresco experience, as well as a gate that leads to the sandy beach! The entire property seamlessly blends indoor living with the outdoors with plenty of glass walls and doors that slide open to the skillfully landscaped grounds featuring natural stone floorings, majestic fountains, and other stunning sights. The poolside living area is significant due to its high-pitched ceiling with corner glass windows that let in ample sunlight. The spacious room is decorated with various Thai mementos and artwork, along with wooden flooring for a rustic vibe. There are comfortable sofas and armchairs in the living room for a cosy sitting area for guests. As there are several two, three-seater table sets, guests are free to dine however they wish. The main dining area is open-sided with a similar high-pitched wooden ceiling, featuring an eight-seater dining table with leather backed chairs. The kitchen is found complete with a breakfast bar and high chairs. It is fully-equipped with modern appliances and state-of-the-art facilities to ensure you have everything you need. Excellent amenities are part and parcel of a stay at Baan Samlarn with services like personal guest assistance, security, gardener, housekeeping etc. available to guests. Along with a daily breakfast that is complimentary, you can even hire a chef at added charges who will skillfully take care of all other meals for you as well. Special services like massages, laundry, car rentals etc. are available at an additional cost. The villa premises also include services of a multipurpose gymnasium as well! Although for the most part you wouldn’t want to leave the comfort of the villa, there are still many things you can choose to explore in Taling Ngam beach including beach clubs like Nikki Beach Samui for drinks and dancing. Lipa Noi beach is also close by and is perfect for an idyllic day out with loved ones for a tranquil morning. 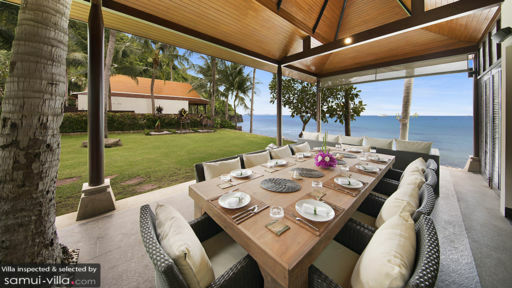 Baan Samlarn is definitely a world class vacation getaway. It’s everything the website promises...once you’re inside the resort compound. The immediate surroundings on the approach to the villas, are quite decrepit and a sight for sore eyes. The miseries of the outsider world however, soon fade away, the moment we’re greeted at the front door by the lovely and welcoming staff. Baan Samlarn, the villa is simply stunning. Every room is beautifully furnished and appointed. Each is uniquely well positioned for a fabulous view of the exterior. The overall setting is thoroughly conducive for guests to let go of all worldly worries and just relax. Aside from the incessant rainfall, we chose to stay in to take full advantage of the amenities and the services that come with the villa. The staff is without a doubt, exceptional. We were all made to feel very welcomed and special the whole time we were there. Kuhn Fon, the property manager, was amazing. She made sure we were treated royally, yet never felt encroached upon. Then there’s the chef. He’s truly an amazing talent, to put it mildly. When it comes to foods, we’re quite hard to please, as we consider ourselves to be well-travelled and some in our group are quite accomplished chefs in their own right. We were all blown away at the level of culinary skills our young chef possesses. Every meal was masterfully prepared, as he effortlessly surprised us with everything from western dishes, to traditional and classical Thai to Italian pasta. Every dish was on point and delicious. We’re beyond impressed. The rest of the staff are equally wonderful. They put fine hotel services to shame. 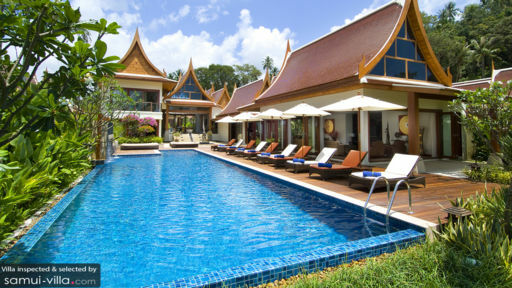 Needless to say, we love Baan Samlarn, and do plan to return again. We’ve already began singing the praises and spreading the word about the villa to all our friends. If there’s one thing that we wish to be improved upon, is that the owner would invest in and install an effective units of mosquito repellents. They do exist. We hired Baan Samlarn for our wedding & stayed there for 4 nights with our wedding party. We had so an magical time there & found it very hard to leave. There were 10 adults & 3 children in our group. The place is so big that we weren't getting in each others way. The staff were so attentive & helped us whenever they could, especially when my father was in hospital they made sure we got to & from the hospital without any trouble. The highlight of our stay was of course having our wedding there, we will never forget the ceremony on the beach followed by the beautiful reception on the lawn. The place just looked so incredible, it took out breath away. As a group we thoroughly enjoyed the dinner every night together with the most delicious food. We all want to go back!! We were invited to stay at this amazing villa by friends of ours. We were two couples with four kids aged 4-8 yrs old. The bedrooms were spacious, well appointed and the aircon worked to arctic conditions. En suite bathrooms were large and had outdoor showers in some bedrooms. The views out to the ocean, and the direct beach access is perfect for kids and adults alike. The private cove along which the villa sits has had no strong current or tide and it was nice and shallow allowing for plenty of water play. An extra bonus is that the beach is West facing so you have amazing sunsets. The villa and grounds are well maintained and there was Wi-Fi and Sonos sound system even in garden, around the pool in dining area by beach. The villa manager, Ms. Fun organized massages, a snorkeling trip on a traditional Thai fishing boat and Jet Ski rental without prior notice. Very impressive. Any wish is her command. She also makes a mean mojito. The rest of the villas staff were kind and gracious and very efficient. Room cleaning and evening turn down services were impressive. Food service was very attentive and professional. The food was amazing; breakfasts with pancakes, bacon and fresh fruits, mid morning Mango smoothies, great Thai dinners that were flavorful and not too spicy. The in villa chef was also very accommodating to kids tastes, French fries, chicken satay, spring rolls, fried rice and home made chicken and fish nuggets were faultless. All in all both adults and children were super happy during the long weekend at this amazing property. I would go back and I would recommend it to others. If you are a bigger party you can also rent adjacent villas. The pool and garden are perfect for lounging and give children enough room to run around supervised by adults who can keep a watchful eye from many different seating areas. I particularly like the covered lounge area on the beach –perfect for reading a book or snoozing with an ocean view and sea breeze. We did not explore surrounding areas, we never left the villa. Can’t wait to go back. We have just returned from eight fantastic days in this heavenly villa. It is in a wonderful setting on its own beach, stylishly decorated and with incredible bathrooms for each room. There were ten of us in the party, but you would never have known that we were a full house as the layout is so well designed with endless different places to sit, by the pool, in the shade or on the beach. The food and service was particularly good, the staff were kind and helpful but also very discreet. We ate out on several occasions but the food in the villa was by far the best we ate. The attention to detail was outstanding, we were treated to delicious fresh mango juice and frsh coconut water by the pool during the day and to cocktails with canapés like dim sum or sushi at night. They organised boat trips, candlelit dinners on the beach and even a fantastic fireworks display one night! I could not recommend this holiday more highly and the only change I would make if I visited again would be to not leave the villa atall! We (7 adults and 3 children under 2) stayed at Baan Samlarn over Easter and i don't usually bother to write reviews but we had such a fantastic time if felt i should do so this time. The villa is lovely. Very nicely decorated and the layout inside and out provides for lots of space even with plenty of other people about so you never feel on top of one another and also has direct beach access facing west for those awesome sunsets. As mentioned in the write up it is close to the ferry pier which we were worried about at first but actually it became part of the scenery as it causes practically no disturbance. What really makes me want to write this is the service we received during our stay. The villa manager, Pon looked after us very well, pandering to every request we had (and we had plenty with 3 babies) including going out for nappies and organising trips, transport, restaurant reservations etc. The other staff were discreet and helpful and made everything seem seamless. The chef was incredible, we did not have better food anywhere else on Samui and actually decided to eat in more than we first planned as it was so good and also amazingly good value. I should also add that Jun at Luxury Villas & Homes Co Ltd who we booked through was great to deal with over many weeks as i was organising the trip and all the requirements for 3 families coming in from different places and it was all spot on. I'm really surprised to see a negative review as this was absolutely one of the best holidays of this type we've ever had and would definitely stay again. Don't stay in this villa even for free. The food was very bad and the air condition on the top floor rooms don't work at all. When we complained the caretaker of the villa said show was aware of this problem and had asked the owner many times to change it but he would not listen. The manager kept arguing the entire day trying to prove we were wrong - saying Thailand is hot in summers - and did not shift us that night. The next day - after spending the entire day complaining to 10 different people - we were shifted to a horrible villa at the same rate . Basically once u have paid the full money they will refuse to do anything for you .